Anolon Nouvelle Copper cookware is a gift to those who love to cook! With copper in the base it is a real joy to cook with. Anolon Nouvelle Copper cookware comes in 2 varieties, stainless steel and hard anodized aluminum. Both are terrific products that are well built, like all Anolon products, and with the stainless steel lids, makes an attractive addition to any kitchen. Anolon Nouvelle Copper cookware is a solid product line for Anolon. It performs well and those who love to cook will really enjoy the copper on the bottom to distribute heat. 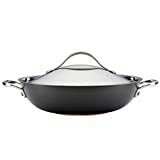 A saucier is just the pan to reach for when making roasted garlic gravy, coconut rice pudding or a béchamel sauce from scratch and the curved sides of this Anolon Nouvelle Copper Hard-Anodized Nonstick 4-Quart Saucier with Helper Handle allows a whisk or spoon to reach all corners easily. With European-inspired design and pleasing, subtle colors, Anolon Nouvelle Copper boasts durable, hard-anodized construction crafted with copper to deliver optimum heat control. A double full cap base on the saucier includes a copper core layered between aluminum and magnetized stainless steel, making it compatible with all cooktops, even induction. PFOA-free restaurant-tested DuPont Autograph 2 nonstick on the saucier is metal utensil safe and delivers long-lasting food release and easy cleaning. Generously appointed cast stainless steel handles are attached to the pan using innovative flat-rivet technology - the convenient helper handle aids in moving the saucier between kitchen stations. Oven safe to 500 and built on a tradition of gourmet quality and high performance, this elegant saucier is an ideal complement to many other items in the Anolon collection. 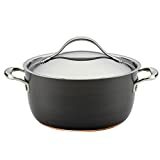 Master a delicious variety sauces, gravies and other culinary creations with the aid of the Anolon Nouvelle Copper Hard-Anodized Nonstick 4-Quart Saucier with Helper Handle. Prepare Asian favorites and other gourmet dishes using this ample Anolon Nouvelle Copper Hard-Anodized Nonstick 12-Inch Covered Wok. Its European-inspired design boasts a graceful flair and the pleasing and subtly contrasting colors add luxury to any contemporary kitchen. Anolon Nouvelle Copper boasts durable, hard-anodized construction crafted with copper to deliver optimum heat control when wilting baby spinach with garlic. A double full cap base includes a copper core layered between aluminum and magnetized stainless steel, making it compatible with all cooktops, even induction. 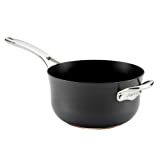 PFOA-free and restaurant-tested DuPont Autograph 2 nonstick is metal utensil safe and delivers long-lasting food release for stir-fried honey ginger chicken and broccoli - and cleaning the wok afterward is easy. The wok features generously appointed cast stainless steel handles that are attached to the pan using innovative flat-rivet technology and the stainless steel lid locks in heat and moisture. Oven safe to 500 and built on a tradition of high quality and high performance, this elegant covered wok is an ideal complement to many other items in the Anolon collections. Flavorful gourmet meals are right at home in the Anolon Nouvelle Copper Hard-Anodized Nonstick 5-Quart Covered Dutch Oven. The pot's European-inspired design features a graceful flair and the pleasing and subtly contrasting colors add luxury to any contemporary kitchen. Create a spicy lobster and shrimp cioppino in the Dutch oven, simmer a roasted vegetable stock or use it to braise a Cornish game hen in raspberry-burgundy sauce. Anolon Nouvelle Copper boasts durable, hard-anodized construction crafted with copper to deliver optimum heat control. This Dutch oven's double full cap base includes a copper core layered between aluminum and magnetized stainless steel, making it compatible with all cooktops, even induction. PFOA-free and restaurant-tested Autograph 2 nonstick delivers long-lasting food release and easy cleaning and is metal utensil safe. Generously appointed cast stainless steel handles are attached to the pot using innovative flat-rivet technology and the stainless steel lid locks in heat and moisture. Oven safe to 500 and built on a tradition of high quality and high performance, this elegant Dutch oven is an ideal complement to many other items in the Anolon collections. Ideal for creating stews, soups and so much more, the Anolon Nouvelle Copper Hard-Anodized Nonstick 5-Quart Covered Dutch Oven adds sophistication to gourmet kitchens.